See the Release Notes for oVirt 4.3.3.
oVirt is installed using a graphical installer in Cockpit. oVirt Engine and a Host are installed together with the Engine running as a Virtual Machine on that Host. Once you install a second Host, the Engine Virtual Machine will be highly available. See the Self-Hosted Engine Guide for full details. Depending on your environment requirements, you may want to use only oVirt Nodes, only EL Hosts, or both. Write the oVirt Node Installation ISO disk image to a USB, CD, or DVD. Boot your physical machine from that media and install the oVirt Node minimal operating system. Instead of or in addition to oVirt Node, you can use a standard Enterprise Linux installation as a Host. Log in to Cockpit as root at https://[Host IP or FQDN]:9090 and click Virtualization → Hosted Engine. Click Start under the Hosted Engine option. Complete the setup wizard. As part of the setup, you will enter the Hosted Engine's name. As part of the setup wizard, you will need to provide the location of your storage. oVirt requires a central shared storage system for Virtual Machine disk images, ISO files, and snapshots. Once the installation completes, oVirt's web UI management interface will start. Browse to https://[Hosted Engine's name]/ to begin using oVirt! See Browsers and Mobile Clients for supported browsers and mobile client information. Once the Engine is installed, you must install at least one additional Host for advanced features like migration and high-availability. Once you have installed additional oVirt Nodes or EL Hosts, use the oVirt Administration Portal to add them to the Engine. Navigate to Compute → Hosts → New and enter the Host details. See Adding a Host to the oVirt Engine for detailed instructions. 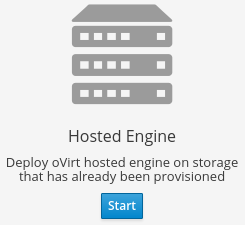 Once oVirt Engine is installed and you have added Hosts and configured storage, you can now install Virtual Machines! See the Virtual Machine Management Guide for complete instructions. 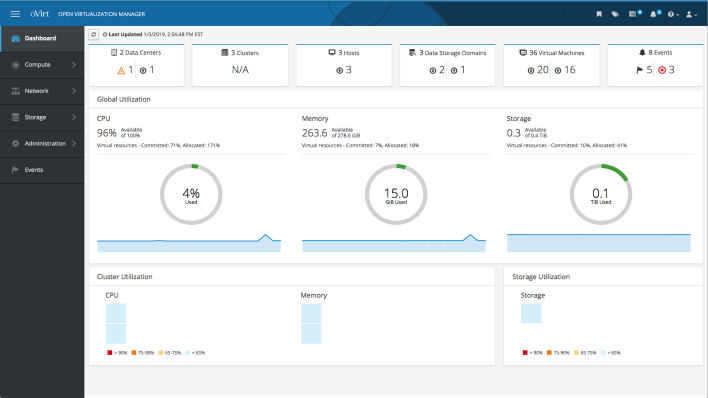 For best Virtual Machine performance and accurate dashboard statistics, be sure to install the oVirt Guest Agent and Drivers for Linux [for Windows] in each Virtual Machine. SPICE drivers (QXL) are not supplied by Red Hat. Distribution's vendor may provide SPICE drivers. The console is a graphical window that allows you to view and interact with the screen of a Virtual Machine. In oVirt, you can use a web-based console viewer or a desktop application (we recommend Remote Viewer). For Windows virtual machines, Remote Desktop Protocol is also available. See Installing Console Components, VNC Console Options, and and Browser Support and Mobile Clients for more information. See RPMs and GPG for older releases, nightlies, mirrors, and GPG keys.